Your’s is the unique-est golf business I’ve ever seen! What a strange (non) word “uniqueness” is, don’t you think? but I hear it used often. The suffix “ness” implies a scale, a measurement or a way of comparing things in an incremental way; like green-ness, red-ness or loveliness. Unique-ness shouldn’t be (and probably isn’t!) a proper word, because there shouldn’t be any way of measuring how unique you are, should there? ; surely if you are unique you are simply, well…unique? Well a lot of my clients fire that one at me because you see, they are all in the same business, namely …golf, and I keep telling them that they have to “define” their uniqueness. This is where the confusion arises, but I do that intentionally…confusion makes them think a bit harder! They invariably tell me that they have a golf course or courses and that due to that; they sell golf. They then usually (not always) go on to tell me that golf is golf is golf and…(they sometimes add the suffix…STUPID) as a result, they cannot differentiate themselves from other golf providers. Of course I try not to take it too personally, but I usually tell them to have a re-think about that last statement. Monday 25th January sees the launch of my new book Golf Business Turnaround-the 7 Essential Steps to Success. Slash your costs without damaging your business, even though you’ve been through the budget 100 times before and thought you’d done everything you could. Explode your income potential starting TODAY, with real techniques you can introduce immediately. In addition to all of this you will now have a system specific to your business that you can use again and again to keep the profits rolling in. 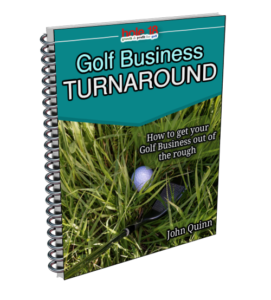 You can pre-book your copy of Golf Business Turnaround, the 7 essential steps to success by completing the form below: Meantime I’ll be back tomorrow with more news. Well the snow is going now, and whilst it was great to feel is0lated and cut off for a while, the fact remains that even where I live in a fairly remote part of upland Perthshire, there is still a 24 hour Tesco within 30 minutes even on snow covered roads, we still had broadband, digital TV and uninterrupted telephone service; there was a well stocked fridge, freezer , wine rack and log shed, we had great fun sledging and building igloos…oh and yes I finished writing my new book on Golf Business Turnaround in relative warmth and comfort. The Recession is going – what next? You will recall about 18 months ago we launched a report on Golf Club Survival, in fact many of you will have had your first encounter with Hole18 as a result of that report. Well that report was more popular than I could ever have imagined when I wrote it and it caused a rush of activity on the site. These five strategies were designed to take advantage of the recession and made changes that normally business leaders did not want to do. There were 4 countries that didn’t technically go into recession (Australia, China, India, and Indonesia) but globally things have been tough for everyone regardless of where they operate.